EclipseChaser Home Page Welcome to the Eclipse Chaser home page! The totally cool, totally awesome, total solar eclipse web site. Winner of the Griffith Observatory Star Award for July 5-11 1998. Sponsored "totally" by Versacorp (TM, SM). © Copyright 1997, 1998, 1999, 2004, 2006, 2008-2011, 2016-2018 Jeffrey R. Charles, All Rights Reserved. Most content of this site is covered by registered copyrights. REGISTERED COPYRIGHTS MCMXCVIII, MMXVII, by Jeffrey R. Charles. ALL RIGHTS RESERVED. Use of material at this site subject to conditions in Versacorp Legal Information Page (www.versacorp.com/vlink/legal/legal.htm). Latest Document Added: 7 October, 2018. 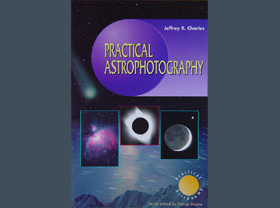 Astrophotography and Eclipse Books and CD's by the Author of this Web Site! The Eclipse Chaser's Guide to... WOW! Registered Copyright MCMXCVIII by Jeffrey R. Charles. ALL RIGHTS RESERVED. Need images or information about eclipses for your planetarium, motion picture, expedition, or other project? Jeffrey R. Charles performs science consulting in regard to eclipse phenomena and instrumentation. Please direct inquiries to Jeffrey R. Charles (jcharles *at* versacorp.com) or click here for more information about total solar eclipse related science and engineering consulting. At Last, a REAL Eclipse! Comments: It is envisioned that this material will later become separate (shorter) web pages. Appendix J: References (data, webcams, etc.) Links NOT monitored or updated. Part 6: The Next One: Will You Be There? Need information about eclipses for your planetarium, motion picture, or other project? Jeffrey R. Charles performs science consulting in regard to eclipse phenomena and instrumentation. Please direct inquiries to Jeffrey R. Charles (jcharles *at* versacorp.com) or click here for more information about total solar eclipse related science and engineering consulting. Welcome to the Eclipse Movie home page alias! Home to an eclipse novel and screenplay! Future home to even more cool eclipse stuff! Total Solar Eclipse, 21 August 2017: Corona: Corona well before totality, diamond ring, chromosphere, inner corona, extreme outer corona, earthshine on moon. (Part of 2017 eclipse journal and image document. Images total 20MB) NEW 12/2017! Total Solar Eclipse, 26 February 1979: Sequence (Full eclipse, but base photo taken well before totality). Total Solar Eclipse, 21 August 2017: Sequence (About 70 percent of eclipse, with totality; part of larger document). NEW! Total Solar Eclipse, 21 August 2017: Wide Angle of Horizon: Totality and horizon with full frame fisheye lens, plus photo to southwest with similar lens. (Part of 2017 eclipse journal and image document. Images total over 20MB) NEW! Total Solar Eclipse, 21 August 2017: Panorama: Single 360 degree panorama of 2017 eclipse SITE, but not during totality. (Part of 2017 eclipse journal and image document. Images total over 20MB.) NEW! Also see the Eclipse Experiments & Data and Astronomy Images & Articles sections. High resolution 360 degree VR eclipse panoramas, including one of the umbra 20 seconds before totality at the Total Solar Eclipse of 11 July, 1991. 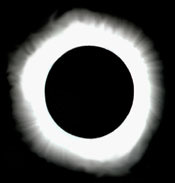 360 degree simulations of the predicted appearance of umbra from Germany at the Total Solar Eclipse of 11 August, 1999. 360 degree panoramic VR movies of the umbra at past and future eclipses. Stay tuned! Video of the lunar umbra, diamond ring, and corona at several total solar eclipses. Astro Images by Jeffrey R. Charles: The following links are for astronomy images that are a part of this web site. Images of a given subject are typically grouped in tables which include appropriate captions. Most tables are only 460 pixels wide, so they should be viewable on most screens. Some images are also referenced in various articles at the EclipseChaser web page. Licensing inquiries for images at this site may be directed to: sales *at* versacorp dot com. Articles & Images: Astronomy, Optics, and more! ALAT - Airborne Large Aperture Telescope. ARDOC - Airborne Relay for Deep-Space Optical Communication. (Major part of ALAT paper; 40K text file). Spin-off Applications for LTA (Lighter Than Air) Related Technology. (Part of ALAT paper; 40K text file). PDF file of entire ALAT paper, a previous ARDOC paper, and all related illustrations. (1.6 mb). Adventures in Astrophotography with a Small Telescope. Flip Mirrors and Other Optical Image Switching Systems. This paper begins with a history of image switching system (flip mirror, etc.) development for astronomical telescopes, including the development of the Versacorp VersAgonal as an amateur project in 1982. It focuses on the use of flip mirrors and other image switching systems for subject acquisition and convenient switching between visual and photographic use of a telescope or other optical system. Some systems, such as the patented Versacorp DiaGuider, combine the functions of a flip mirror and off-axis guider. Most of this document is under construction. 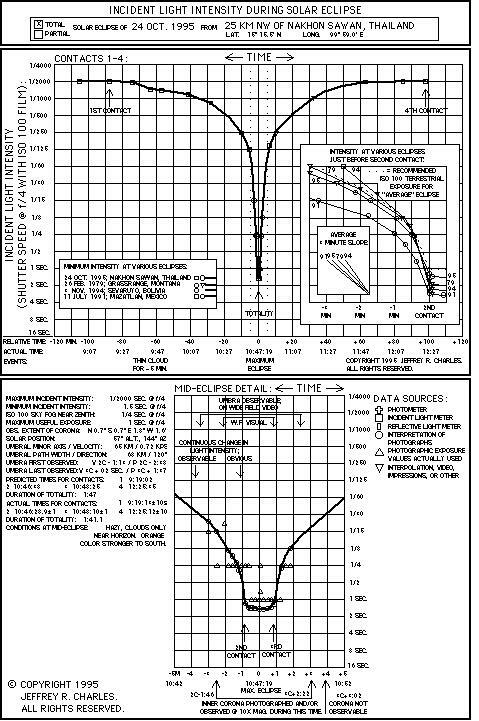 Looking for wide angle optics and related instrumentation? Versacorp offers instruments such as patented axial strut wide angle reflectors and indexing rotary camera platforms for taking 360 degree panoramic images. The Falsehood of Cosmic Doomsday Myths: Fact Versus Fiction in the Solar System. Poems, Lyrics, and Musical Compositions. 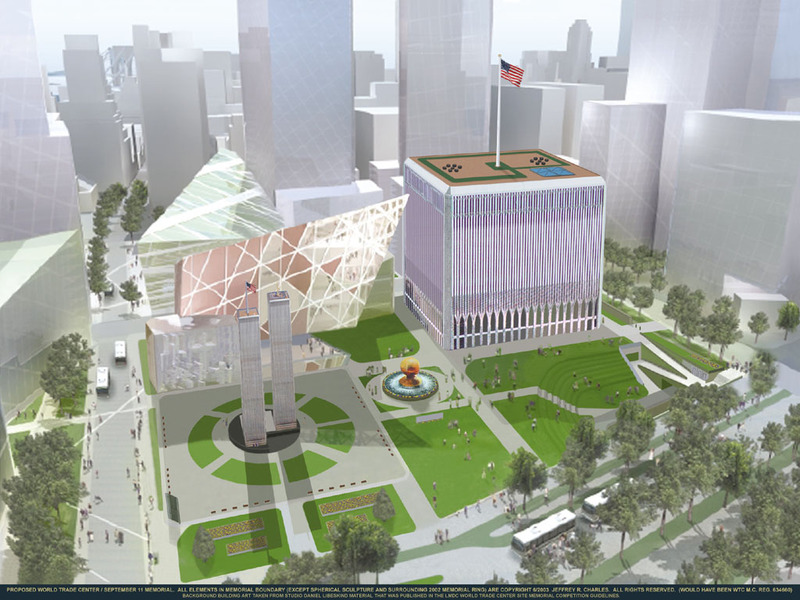 A tribute to victims of war and terrorism, with emphasis on 9/11. Reviews of products that may relate to above articles, etc. All text and images © Copyright 1997-2017, Jeffrey R. Charles or Specified Organizations. as Part of the "Practical Astronomy" Series. CD: Navagable CD of Eclipse Chaser web site, plus high resolution 360 deg. VR eclipse site images. Video: An eclipse video is unlikely, partly because the first 4 eclipses were shot in analog SD video, and there is little 2017 footage of anything but the eclipse itself. A 2-hour digitally edited chronicle of 5 total solar eclipse expeditions had been planned. If a video is made, it may just be posted on a video site, preceded by video ad, but not banner overlays. Book: A hard copy book is unlikely, partly because printing costs are high for a book with images that could rival large HDTV and computer displays. CD: EclipseChaser web site (with extra images): $19.95 including CONUS shipping. An updated version (larger pix) may be available in late 2018. Click HERE to see larger image of CD cover. Prices and availability subject to change w/o notice. Need information about eclipses for your planetarium, motion picture, or other project? Jeffrey R. Charles performs science consulting in regard to eclipse phenomena and instrumentation. Please direct inquiries to Jeffrey R. Charles (jcharles *at* versacorp.com) or click here for more information about total solar eclipse and astronomy related engineering consulting and optical instrumentation. Links to and documents about more recent solar eclipse observations are under construction. Astronomia Sigma Octante, (ASO) an astronomical research center in Cochabamba, Bolivia. Click here to see their home page! Click here to see a brief abstract about ASO. Other astrophotography links under construction. Chasing the Shadow / Harris & Talcott / Kalmbach / 0-913135-21-6 / Well organized and easy to read. Observe Eclipses / Reynolds & Sweetsir / The Astronomical League / 1-886336-10-5 / Good technical info. Also covers lunar eclipses. The Sun in Eclipse / Maunder & Moore / Springer-Verlag / 3540761462 / Includes some details about future eclipses through 2020. Totality: Eclipses of the Sun / Litman & Willcox / University of Hawaii / 0-8248-1371-5 / Good sections on the causes of eclipses and on eclipses in mythology. "A goldmine of solar eclipse information and images from a dedicated eclipse chaser and former NASA engineer." "Just saw your Eclipse Chasers Page! Great site! Very interesting!" "You must be down to about the second joint on your fingers after all of the work that you have done on your TWO web pages! Very nice, I am impressed." "I sure have enjoyed your Mazatlan journal, you write beautifully! It was so well written that it raised my pulse." "Your eclipse image is fantastic! How did you do that?! Please tell me how I can do that!" "I looked at www.eclipsechaser.com - very impressive, and fast!" "Great pages! Thanks for doing it! Awesome!" "An aficionado's dream come true. Expedition planning, equipment, a picture gallery, and an eclipse journal all the way back to 1979. As this page says, "Wow!"" The EclipseChaser web site is winner of the Griffith Observatory Star Award for July 5-11 1998. This web page includes Total Solar Eclipse and Astronomy related articles and images. Together, these comprise an on line resource for eclipse chasers and astrophotographers. It is envisioned that this material will eventually be available in book and multimedia form. In order to allow expeditious navigation by persons with retrobrowsers (as old as Netscape 2) or slow Internet connections, graphics and frames are not used in the table of contents, and links to most articles typically indicate the size of related text and image files. This web page is administered by Jeffrey R. Charles and served by KTB. Please send relevant E-mail to Jeffrey R. Charles (jcharles * at* versacorp.com) . The content of this web page is intended to be equivalent to a "G" movie rating unless specifically noted "PG" in a given link or section, so this site should be suitable for visitors of all ages. The content of first level (i.e. "direct") links from this web page should be equivalent to a "G" or "PG" rating. Please E-mail Jeff Charles at Versacorp (jcharles * at* versacorp.com) if you find that any of the direct links have ceased to be equivalent to a "G" or "PG" rating. Thank you. No claim is expressed or implied as to the accuracy of information at this site or the performance or quality of products and services provided by vendors and service providers referred to at this site. Accordingly, Jeffrey R. Charles and Versacorp shall be held harmless with regard to all direct and consequential damages which may result from using information herein or contacting or conducting business with any referenced individuals, vendors or service providers. Further, Jeffrey R. Charles and Versacorp shall be held harmless in regard to any real, consequential, or imagined damages (and associated claims) whether said claims relate to the accessibility or inaccessibility of, use of, or actions suggested or inspired by any data, inferences, suggestions, techniques, or other aspects of material in or associated with this web page. Material from this or any associated web page may not be broadcast, published, or otherwise reproduced unless the following conditions have been read, agreed to, and complied with by the subject users, broadcasters, publishers, or their legal representatives. These conditions include the prior express written consent of Jeffrey R. Charles and the prominent display of his copyright notice. Accordingly, anyone who reproduces, broadcasts, distributes, or commercially uses material from this or any associated web page shall be deemed to have agreed to the terms, conditions, and royalties set forth below and in the linked Legal Information Page. 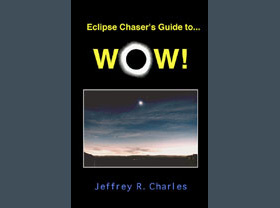 All text, images, and other content (except specifically indicated quotations from others such as those in the "What people are saying about Jeff Charles' EclipseChaser web site" section) are Copyright © 1975-2006, 2008-2011, 2016, 2017 (Registered Copyrights 1998, 1999, 2010, 2017) Jeffrey R. Charles. ALL RIGHTS RESERVED. In addition to other indicated restrictions, the following conditions apply to all limited and unlimited use of all documents, data, images, or other material written or produced by Jeffrey R. Charles, served under or transferred from this web page or the domains "versacorp.com", "eclipsechaser.com", or derived from material therein, whether said material was obtained directly or indirectly: All reproduction or use must be pre approved in writing. All permitted use, reproduction, or affixing any part of subject material to any permanent media (including magnetic media) is permitted only on the condition that every copy or fixation of said material; is not altered, modified or defaced; includes references to this home page and the names of all applicable articles and authors; and that all names, patent notices, copyright notices, authorship notices and credits are either left unmodified or are prominently displayed in or immediately adjacent to each image and article. It shall also be prominently indicated on every copy or fixation of said material that commercial and intellectual property rights to data and other material therein are not transferable. Unauthorized use is prohibited. Additional restrictions may apply. Please see the linked Legal Information Page. Retro browser friendly site! Written for Netscape 2 and newer browsers. CONDITIONS OF USE APPLICABLE TO THIS SITE. Copyright © 1996, 1997, 1998, 1999, 2004, 2006, 2008-2011, 2016-2018 Jeffrey R. Charles, All Rights Reserved. Content of this site covered by registered copyrights (Copyrights Reg. 1998, 1999, 2010, 2017). Copyright MCMXCVII by Jeffrey R. Charles. ALL RIGHTS RESERVED.